At the same time, he noted, the percentage of all private school elementary students enrolled in religious non-Catholic schools — whether an evangelical Protestant academy in Kansas or a Jewish day school in New York City — has skyrocketed from just 8 percent in 1965 to 45 percent in 2013. The proportion of kids attending non-religious private schools increased from 4 percent to 18 percent over the same period. 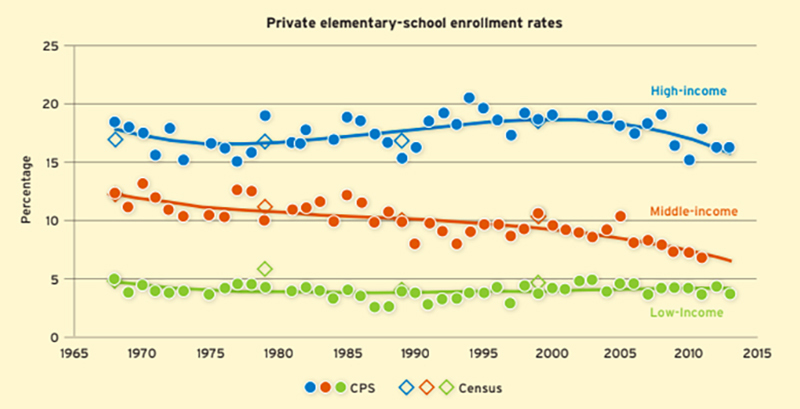 What explains the decline in market share commanded by Catholic elementary schools? The departure of white families from urban centers, sometimes called “white flight,” is one factor. The traditional constituency for Catholic education was urban, middle- or working-class whites, often the children of Irish, Polish, Italian, and Lithuanian immigrants. As they decamped to the suburbs in huge numbers beginning in the 1960s, the number of parents willing to pay Catholic school tuition plummeted. That explains why the number of Catholic schools dropped by 37 percent between 1970 and 2010 — a loss felt predominantly in the areas of the country where Catholics have historically been most plentiful, the Northeast and Midwest. In those that remained open, the financial calculation has changed. Once a popular choice among the working class, Catholic schools have raised their inflation-adjusted annual tuition nearly 600 percent in those four decades, from $873 to $5,858. During a long period of stagnation for middle- and working-class wages, that was a recipe for polarization by income. The authors make frequent reference to the “90-50 gap” — the disparity in private school attendance between families at the 90th percentile of income and those at the 50th percentile. 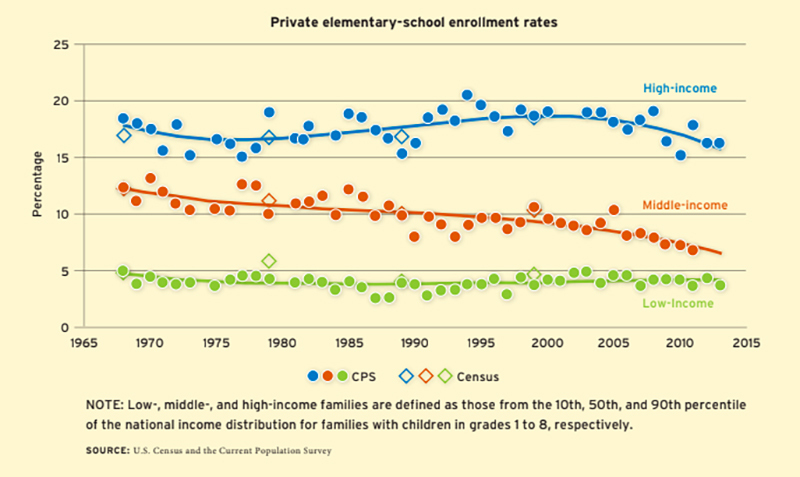 In terms of overall private school attendance, that gap stood at 5.5 percentage points in 1968, when roughly 12 percent of middle-income children and 18 percent of high-income children attended private schools. It grew to 9.3 percentage points by 2013; while both groups were less likely to send their children to private schools, the decline among middle-income children (to 7 percent) was much larger than that among high-income children (to 16 percent). Perhaps nowhere is the 90-50 gap more prevalent than in the small but growing sector of private non-religious schools, which have become an attractive option for upper-class families. The enrollment rate of affluent students at such schools tripled between 1969 and 2011, from 2 percent to 6 percent, and the 90-50 gap grew from just 1 percentage point to nearly 5 percentage points over the same period. Meanwhile, the country has seen a remarkable growth in the enrollment of students at religious non-Catholic schools, particularly in the South. That expansion took place during a fraught period of America’s slow-moving culture war, as the Supreme Court moved to ban prayer in public schools; the authors also note that court-mandated desegregation orders may have led middle- and upper-class families to flee the public school system in the same way that their Northern counterparts were moving from the cities to the suburbs. If the South’s more affluent families came to view private schools as an escape hatch from a school system that was increasingly racially mixed, it would explain why the 90-50 gap doubled there between 1968 to 2013, to an extraordinary 14 percentage points. Murnane said that the growth of non-Catholic religious schools should spark more research. While Catholic schools have been a part of America’s educational framework for over a century, and have worked hard to adapt to the era of educational accountability (about half of the nation’s 195 dioceses adopted the Common Core learning standards, for instance), the non-Catholic religious sector is newer and much more opaque.